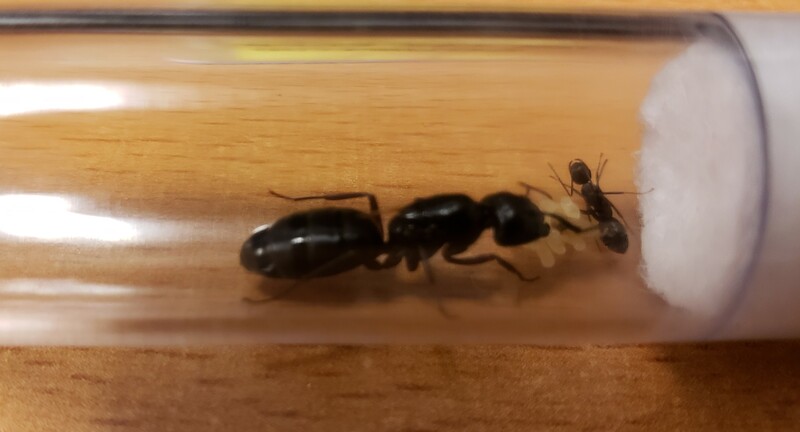 I caught my first queen this year on June 2nd. I believe she is a Camponotus pennsylvanicus. She laid her first eggs after a few days. She has had a little bundle of eggs for some time now. But it's been over 3 months and they still look the same and I'm not concerned that they won't develop. 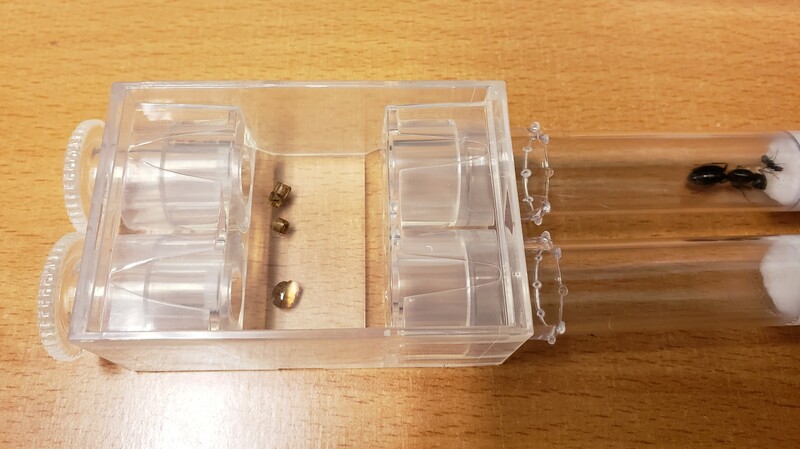 She's in a test tube setup, kept in the dark in a cupboard. Never fed her. Temperature is whatever the room temp is, so likely around 22ish degrees C.
My only guess would be to put her somewhere warmer, but I'm not sure where. Attached is a picture. She is clutching her bundle of eggs. The right side of the tube is another test tube with more water that I am trying to get her to move into as her current water on the original tube is low. I've left her current tube uncovered and covered up the new one, which is inserted into the end of the first one. Id give her a small drop of honey, and a tiny bit of protien. then give her heat as well. since the eggs havent grown, chances are they are trying to hibernate presumably because its too cold. Another theorie could be that the queen keeps eating the eggs because she is too stressed. And then she lays new eggs and to you it looks like the eggs aren't developping. You should however try to give them some heat. Just to make sure those little fellows aren't freezing their underdevelopped asses off. Queen could also be infertile. 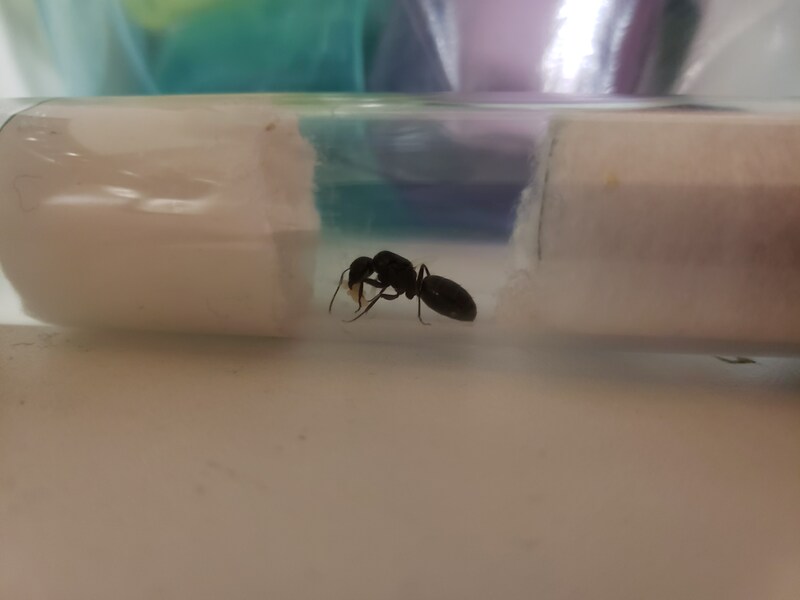 I had a tetramorium queen that lived for months laying eggs the entire time that never developed into larvae. After 4 months I gave up on her. Ah that would be unfortunate, I thought they died after a few weeks if infertile. I will try getting her somewhere warmer and see if that does anything. I was also thinking this as well thats what it sadly sounds like to me. lets hope that isnt whats happen you are in Ontario and it has been cold lately so that may also be the reason get yourself a heating pad or maybe even a heating cable for reptiles and put it close to the tube not to close that you will hurt or cook the queen but enough to keep them around +20 or if you have a room that stays around that to. once you start going lower then that they start slowing down alot and +10 can trigger hibernation so keep this in mind for where you put her. How often have you been checking on her ? How often have you been checking on her ? Probably too often, especially since trying to get her to move to the new tube. I'll take a peek every day or two. I will try and warm her up, I've been trying to decide the best way. I was thinking the heating pad idea. 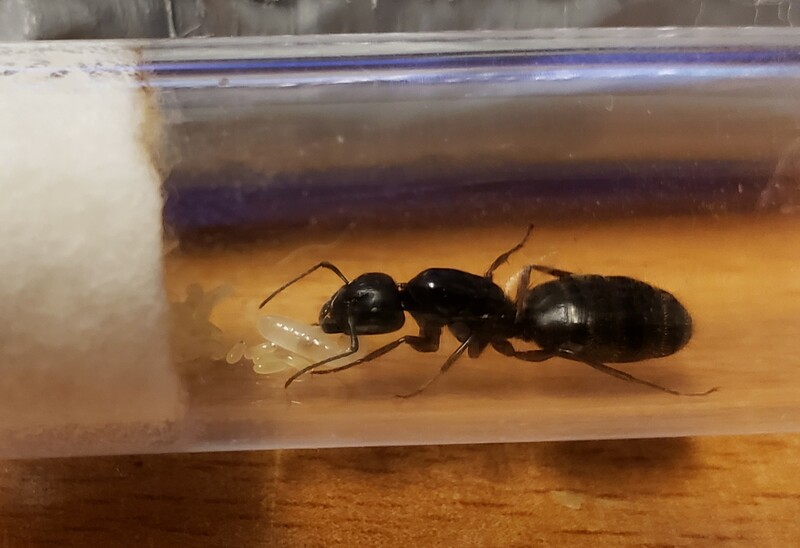 My queen actually just got her first nanitic this past weekend! It took 7 months. I was certain at this point that she was infertile and that she was just laying eggs and eating them, or they were simply not developing. But, kept changing her water when needed and giving her some honey. And raised the temperature with a heating cable near her. And then last week she made a new egg that was way bigger then the others. And finally this one became a pupae, etc. I was expecting it to be an alate, something I had read could happen with infertile queens. But it hatched and doesn't have any wings! I ended up attaching the tube to an AC Test Tube Portal to start giving new food. Put in a few little meal worm pieces and by the next morning one of the pieces had been brought into the tube beside the eggs. So I'm super happy and hopefully more workers will be born soon! This is a common myth. queen's don't die when they are infertile in the wild they do but in captivity they can live for a long time.